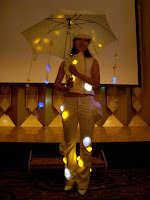 I watched a 1-hour long fashion show dedicated to wearable computers in 高松 (Takamatsu, Japan) on 20 May 2005 as part of the 3rd International Conference on Active Media Technology, where I gave a talk. The show was organized by 塚本昌彦 (TSUKAMOTO Masahiko), and consisted mainly of conceptually interesting garments that serve as pianos, emit light or display messages. I now look forward to seeing advanced versions of such clothes, well integrated and usable in everyday life.